Forget Monaco Grand Prix – the smell of burning rubber, screeching tyres and a throaty roar could be heard in Bournemouth’s Lower Gardens yesterday (16 October) as Schumacher’s Benetton Formula One championship car sped through for a demonstration and taster of what’s to come at the new Wheels Festival – May 24-26 May 2014. 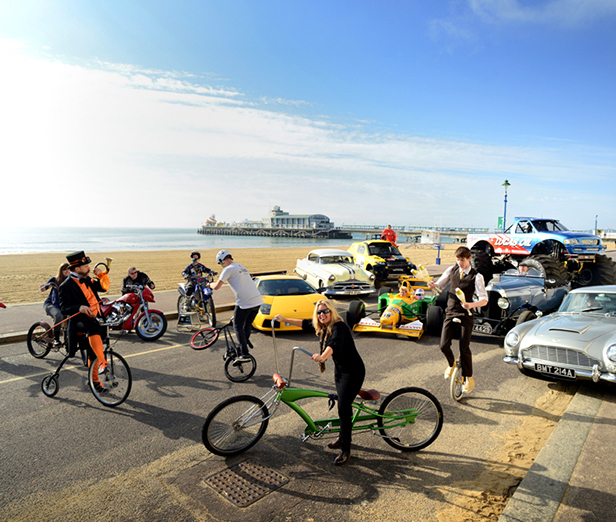 Launching this exciting festival in spectacular style, the magnificent F1 car was joined by an array of pedal power and vehicles of every type. The super line-up showcased included a sleek yellow Lamborghini Murcialago, vintage pedal bikes, a 1928 Bentley, Bigfoot Monster Truck, Penny-farthing, freestyle motocross stunt bike, custom bike, James Bond Aston Martin DB5, Dakar rally car, a 1931 Ford Sedan, a 1953 Pontiac Catalina, two unicyclists and Brum, the children’s car. More exciting and unique content will be announced over the coming months. Mark Smith, Director of Bournemouth Tourism, said: “We are committed to investing in and continually enhancing Bournemouth’s tourism offer as well as providing a high quality entertainment programme for residents and visitors to enjoy. Wheels Festival will use a similar business model to the hugely successful Air Festival, which is estimated to bring over £25million into the local economy, benefiting business while boosting the town’s profile. It will be funded through trading stands, sponsorship, and support from the local trade, as well as contributions from Bournemouth Council in addition to both the town centre and coastal BIDs. The new festival is expected to attract around 360,000 to the town, with a mix of local people and visitors coming to taking advantage of a top class event and world-class entertainment.